A wooden-frame house under construction – in this example of platform framing the location of the upper floor is readily discerned by the wide joists between the floors, and the upper structure rests on this platform. Framed construction was rarely used in Scandinavia before the 20th century because of the abundant availability of wood, an abundance of cheap labour, and the superiority of the thermal insulation of logs; hence timber framing took off there first for unheated buildings such as farm buildings, outbuildings and summer villas, and for houses only with the development of wall insulation. Light-frame materials are most often wood or rectangular steel, tubes or C-channels. Wood pieces are typically connected with nail fasteners, nails, or screws; steel pieces are connected with pan-head framing screws, or nuts and bolts. Preferred species for linear structural members are softwoods such as spruce, pine and fir. Light frame material dimensions range from 38 by 89 mm (1.5 by 3.5 in); i.e., a Dimensional number two-by-four to 5 cm by 30 cm (two-by-twelve inches) at the cross-section, and lengths ranging from 2.5 metres (8.2 ft) for walls to 7 metres (23 ft) or more for joists and rafters. Recently, architects have begun experimenting with pre-cut modular aluminum framing to reduce on-site construction costs. ^ Oxford English Dictionary Second Edition on CD-ROM (v. 4.0) © Oxford University Press 2009. Frame, Framing, Framer, Framework, Frame-house. ^ Townsend, Gilbert. Carpentry and joinery: a practical treatise on simple building construction, including framing, roof construction, general carpentry work, and exterior and interior finish of buildings. Chicago: American Technical Society, 1913. Print. 17. ^ Harri Hautajärvi, "Houses in Finland", Helsinki: Rakennustieto, 2011. ^ a b c d McKeever, D.B. ; Phelps, R.B. (1994). "Wood products used in new single-family house construction: 1950 to 1992" (PDF). Forest Products Journal. Retrieved March 3, 2007. ^ a b Kumaran, M.K. ; Mukhopadhyaya, P.; Cornick, S.M. (2003). "An Integrated Methodology to Develop Moisture Management Strategies for Exterior Wall Systems" (PDF). 9th Conference on Building Science and Technology, Vancouver. Archived from the original (PDF) on 2018. Retrieved March 3, 2007. ^ a b APA. 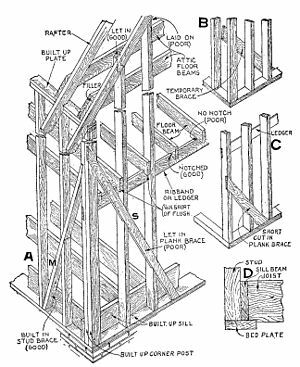 "Advanced Framing Construction Guide" (PDF). apawood.org. Retrieved September 1, 2014. ^ a b c d Anderson, LeRoy Oscar (1992). 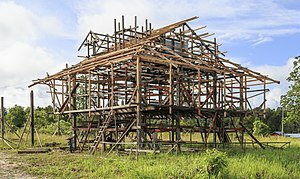 Wood – Frame House Construction. Books for Business. ISBN 9780894991677. ^ a b c Sherwood, G.; Moody, R.C. "Light-Frame Wall and Floor Systems" (PDF). United States Department of Agriculture Forest Service Forest Products. Retrieved March 13, 2007. ^ Oide, K. (1977). "Joining and fixing structure for ceiling boards and paneling". US Patent 4,057,947. Retrieved March 13, 2007. ^ a b Kosny, J.; Desjarlais, A.O. (1994). "Influence of Architectural Details on the Overall Thermal Performance of Residential Wall Systems". Journal of Building Physics. Retrieved March 3, 2007. ^ James M. McPherson (16 June 1988). Battle Cry of Freedom: The Civil War Era. Ballantine Books USA. p. 17. ISBN 978-0-19-503863-7. ^ Ching, Francis D. K. (1995). A Visual Dictionary of Architecture. Van Nostrand Reinhold Company. p. 267. ISBN 0-442-02462-2. ^ Holske, Louis R. (June 1921). "The Specification Desk – A Department for Specification Writers – What the Specification Writer Wants to Know". Pencil Points. II (6): 228–229. ^ Miller, Donald L. (1996). City of the Century – The Epic of Chicago and the Making of America. New York City: Simon & Schuster. p. 84. ISBN 0-684-83138-4. ^ Gideon, Sigried (1952). "The Balloon Frame and Industrialization". In Mumford, Lewis. Roots of contemporary American architecture: a series of thirty-seven essays dating from the mid-nineteenth century to the present. Reinhold. pp. 201–205. ^ Indiana DNR, Division of Histo; ric Preservation and Archaeology. "Historic Building Research Handbook" (PDF). Retrieved June 13, 2013. ^ a b Cavanagh, Ted (1999). "Who Invented Your House?". Who invented your house (text only) | Ted Cavanagh - Academia.edu. American Heritage of Invention and Technology Magazine. Retrieved February 23, 2016. ^ Maass, John (1957). The Gingerbread Age – A View of Victorian American. New York City: Crown Publishers. p. 140. ISBN 0-517-01965-5. ^ Woodward, George Evertson (1865). Woodward's Country Homes. New York City: Geo. E. Woodward. pp. 151–152. ISBN 1-112-22157-3. ^ Duncan, Hugh Dalziel (1989). Culture and Democracy: The Struggle for Form in Society and Architecture in Chicago and the Middle West during the Life and Times of Louis H. Sullivan. New Brunswick: Transaction Publishers. p. 554. ISBN 0-88738-746-2. ^ Wagner, Kate (6 August 2018). "The Case for Rooms". CityLab. Retrieved 13 August 2018. ^ "Common Roofing Materials". 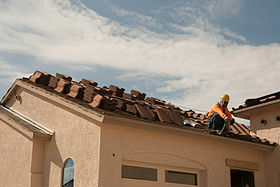 Associated Roofing Contractors of the Bay Area Counties. arcbac.org. ^ Lewington, Jennifer (December 1, 2014). "Six-storey wood buildings 'a game-changer'". The Globe and Mail. Retrieved May 2, 2016. Canada Mortgage and Housing Corporation (2005). 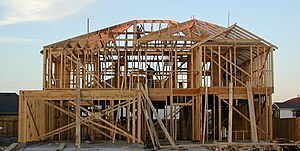 Canadian Wood-Frame House Construction. ISBN 0-660-19535-6. Lienhard, John H. (1993). The Engines of Our Ingenuity. Episode 779. "Balloon Frame Houses". NPR. KUHF-FM Houston.